These animals are found all over Africa, in dry and wet climate. They need access to water, and a food source (termites). Aardvarks only feast on termites, and they go from termite mound to termite mound digging these up, and feeding on the termites. The Aardvark has a long sticky tongue which is used in eating termites. Did you know? The aardvark has very poor eyesight. 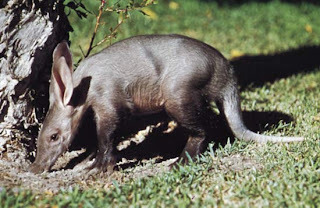 Aardvarks have large powerful claws on their feet, and these are used in digging. They have a short cone shaped tail, and long ears which are usually upright. It has an almost hairless body, a short neck and short legs.